The Hollywood actor greeted Muscovites in Russian and talked about the protection of life on Earth. 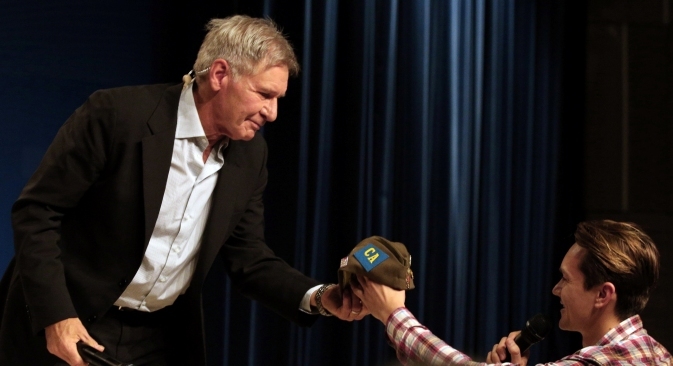 Harrison Ford visited Moscow to personally present his new fantasy thriller, “Ender’s Game.” This is not the first time the actor has visited Moscow: He went there once to talk to the crew of the K-19 nuclear submarine for a previous film. Once again, his new movie involves a case of heroism and a commander’s responsibilities in the face of inevitable losses. Harrison Ford is remembered in Russia not only as Han Solo from the Star Wars trilogy, or as the title-character from the Indiana Jones films. Shortly after the wreck of the Russian submarine “Kursk,” a Hollywood film was made about the 1961 accident in the Danish Straits, where eight sailors died from radiation sickness (26 sailors in the film). In “K-19,” Alexey Vostrikov, the character played by Ford and similar to Col. Graff in “Ender’s Game,” has to take responsibility for the lives of his crew. “K-19” turned out to be more interesting for Russian audiences than for Americans: Russians are the real heroes in this film. Thus, it was received with enthusiasm in Russia, despite fierce debate about the historical accuracy of the details. Ford’s new film, “Ender’s Game,” is set in 2135. A training base is being created in outer space to prepare children and adolescents as soldiers and military leaders. The fighters of this generation grew up on video games, so they think unconventionally and show no mercy. Ford plays one of the main roles — Col. Graff, a teacher of the young warrior,Ender Wiggin, who must resist an alien race of insects and save humanity from extinction. “The question is: Who can be a real teacher? What qualities are needed for this?What role do parents play?” said Ford. According to the actor, the story told in this film is relevant for both children and parents. The boy not only grows up, but also becomes a leader of humanity and a true hero at just 12 years of age. During the preview of “Ender’s Game,” Russian viewers were surprised that Ford's character was willing to sacrifice his talented pupil to achieve the objective. The eternal question of whether ends justify the means — which has been relevant in Russia since Dostoevsky’s time — and the question “about the tears of a child” make people think. The bookon which this film was based,“Ender’s Game” by Orson Scott Card, is often recommended for future officers of the U.S. Navy. It is a description of the qualities that a leader should possess. “One of the most important characteristics of a commander is the ability to reconcile himself to losses, which are inevitable. This is a great moral responsibility, and Col. Graff is ready to bear it,” said Ford about his character. It is somewhat surprising that, for Ford, the premise of the film — aliens threatening humanity — has become a metaphor for nature, which is trying to find any means to survive. Every form of life wants to protect its own kind and seeks places to flourish. “Now, I think the main thing is to protect our nature and the world around us. We have to deal with the vanishing of forests and of fish in the ocean. We should not focus on public and domestic political problems; we should think about sustainable development objectives,” said the actor in Moscow. “Let's not be arrogant, because we are just one of many species,” Ford told Russian viewers. Nature givesto humanity those things that we are unable to giveto ourselves. Nature raises and protects us; we need it, but it does not need us. This is one of the messages that can be heard in this sci-fi thriller. “Ender’s Game” will be released in Russian cinemas on Oct. 31. In addition to Harrison Ford, Asa Butterfield, Ben Kingsley and Viola Davis star in the film.